Irving “Papa” Gelman was born in Hosht, Poland and survived the Holocaust by hiding in a dirt hole inside a peasant farmer’s barn for 16 months with his parents, sister, and future wife, Rochelle. Papa had a rich history in Jewish education which began with his father who was involved in starting a school in Poland to allow Jewish culture to survive and thrive. 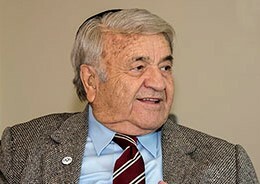 The school was called Tarbut which means “culture.” Papa’s passion for Jewish education led him to help manage and secure funding for two Jewish schools in New Jersey — Yavneh Academy and The Frisch School — before relocating to Orange County in 1984. In 1991, he founded Tarbut V’Torah Community Day School in loving memory of his daughter, Naomi Gelman Weiss. Since its opening, Tarbut has grown from 36 students to a flourishing TK-12 college preparatory school and now boasts an enrollment of over 500 students and 580 alumni. On the TVT campus, students called him “Papa,” and whether he was visiting a classroom or strolling across campus, they would often go out of their way to give him a hug. Rochelle and the Gelman family thank you for your donation in his honor. To donate by credit card, click “donate” and follow the prompts. Please note: Payments by credit card will incur a 3% administrative cost. Your donation or contribution to a fund will be reduced by this amount. You will receive a tax receipt for the full amount charged. Contributions by check to the Irving & Rochelle Gelman Philanthropic Fund can be mailed to the Foundation. Please clearly specify the fund name in the memo line. Current Fund holders may complete a Donor Request Form to transfer funds to the Irving & Rochelle Gelman Fund. Please clearly specify the fund name in the purpose/memo line. Please contact the Foundation for further assistance.